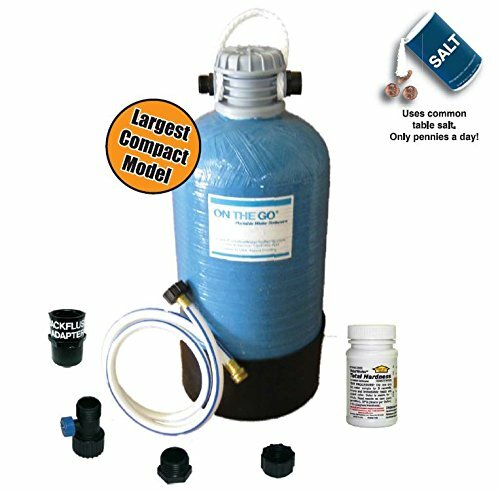 The On The Go OTG4-DBLSOFT Portable RV Water Softener is the perfect water softener for those who wish to have soft water while traveling in a recreational vehicle, mobile home, or marine vehicle. It’s small and lightweight design allows for it to fit in small spaces, which is perfect for those who travel and wish to have soft water regardless of where the water is coming from. This small softeneris also incredibly powerful for its size, supplying more soft water than its competitors over time. This softener does not take much effort to run – quickly hook it up by following the easy-to-understand instructions, add two 26oz. boxes of table salt, let the softener run for a half an hour – and this effective water softener will run for the next 1600 gallons without maintenance. This water softener is perfect for recreational and marine vehicles because it supplies 40% more water than other comparable softeners but is small enough to fit in compact spaces. The size of the softener is 16,000 grain. Dimensions: 22” tall with a 9.5” diameter. Regenerates in less than 30 minutes every 1600 gallons or 40 days. Includes an easy-to-carry handle on top, high grade resin, inlet hose, and an option for cap and plug to prevent leaking. Designed with a 360 degree swivel so the inlet hose can be connected easily. Will increase the lifespan of appliances while preventing hard water, rust stains, and scale build-up. Back-flush adapter included to reverse connection quickly when needed. Overall, consumers are extremely satisfied with this portable water softener. Almost ninety percent of consumers who own this water softener give it a perfect rating and would recommend it to others. These consumers state that the portable water softener works extremely effectively. It is simple and convenient to set up because it requires no tools to do, and it is easy to regenerate because it requires very little salt. What consumers like most about this portable water softener is how effectively it works. Many consumers tested their water before installing the water softener and after installing the water softener, and note an extreme decrease in the amount of hard water flowing through the pipes and scale build-up on dishes and appliances. There is only four percent of consumers who are less than satisfied with the water softener. These consumers are dissatisfied because either their softener didn’t work as designed (it tipped over and leaked or it stopped softening water), or the consumer does not agree with the price of the water softener. However, because so few consumers are dissatisfied with this portable water softener, it seems like this water softener is a reliable system for those who wish to have soft water regardless of where the water comes from. 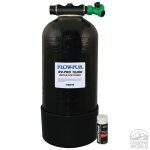 This water softener is extremely convenient to use. Because of it’s compact nature and it’s ease of installation, it’s designed especially for living on the go. This compact softener only needs two boxes of 26oz. table salt to regenerate and only takes about a half hour to complete. It requires no tools or electricity for installation. Simply connect the inlet hose to the softener and to the RV’s water supply, add salt and regenerate, and it’s ready to use. The inlet high-flow shut-off control valve promotes a slow rinse time which improves water quality and water capacity. 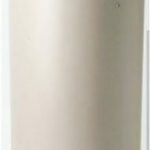 There doesn’t seem to be many disadvantages discussed by consumers about this water softener, which bodes well for the quality of the water softener. Consumers overall are overwhelmingly happy with this water softener. The only disadvantage that consumers complain about is that the hose fittings that come with the water softener are made of plastic and have the possibility of leaking, but most consumers didn’t seem to have this problem with the water softener’s attachments. This negative review could be situational to the particular consumer that left the review. Either the attachments were not attached properly, or those particular attachments were defective. The Double Standard Softener & Conditioner produces twice the gallons compared to the standard model and is the largest compact RV softener on the market. Built for the owner of any RV/Marine model, this 16,000 grain unit is a perfect fit and supplies approx. 40% more soft water than any other unit on the market. It simply regenerates with 2 boxes of common table salt in less than 30 minutes and provides the owner with soft water up to 1600 gallons or up to 40 days. Its compact, space-saver design allows it to be installed in the tightest places. It will allow high flow rates with very low pressure drop. Its unique features includes easy to carry handle on top, large mouth opening for easy salt addition, high grade premium resin, 360 degree swivel for easy connection of the inlet hose, travel friendly option of cap & plug to prevent leakage and is built for quick & simple regeneration. It utilizes a standard garden hose connection between park faucet and your RV/Marine, requires NO tools or electricity and its compact design 22"H x 9.50"dia. can be easily stored in your storage bay or dock side locker.